Perennial is a term that describes what many gardeners and homeowners desire…a plant that comes back every spring! There are perennial plants that can meet just about every need a gardener has. 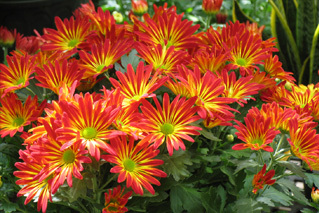 Perennials range from low to tall, from colorful bloomers to those with marvelous foliage or glowing seed heads. The perennial garden can contain plants that flower, plants with colorful leaves and foliage, and low growing ground covers for that especially shady spot. Perennial gardens are abundant with texture and variety and create a peaceful atmosphere you can enjoy year after year. Most perennials are herbaceous, which means they tend to die back to the ground each winter. Perennial plants generally are sustainable with lower care and maintenance needs. Blooming perennials tend to average about 3-4 weeks of bloom time so choosing plants with attractive structure and foliage and flowers will enhance your landscape for years to come. Although most perennials do not bloom all summer, planting perennials with different blooming times ensures your garden will have color all summer long. We raise hundreds of perennials every year including, sun and shade tolerant varieties, hostas, daylilies, clematis, iris, and many more! Feel free to browse our 5 perennial greenhouses! Our perennial inventory is constantly changing, so please call for a current availability.